A digital marketing strategy is defined as a set of practices for marketing products or services using digital channels. A solid digital marketing strategy is the one that aligns different digital channels to efficiently and meaningfully target well-defined customer personas. The ultimate goal is to find the people who are interested in your products or services — we call these people leads — and convince them to buy from you and keep doing that. In this guide I’m going to walk you through every necessary step of planning and implementing a solid digital marketing strategy for your business. Every step explains the importance of a digital marketing concept and provides a mini-guide on how it should be done. Finally I offer a set of tips for optimizing your performance in that area. Digital Marketing, Emarketing, or Internet Marketing? Dave Chaffey notes that although digital marketing, emarketing, and internet marketing are the terms that refer to more or less the same practices and their difference is “semantic”, there are some differences in definition and scope. Internet marketing includes “the use of a company website in conjunction with online promotional techniques . . . such as search engine marketing, interactive advertising, e-mail marketing and partnership arrangements (affiliate marketing) with other web sites. And finally we have digital marketing. Digital marketing is applying digital technologies “which form online channels to market, that’s web, e-mail, databases, plus mobile/wireless & digital TV . 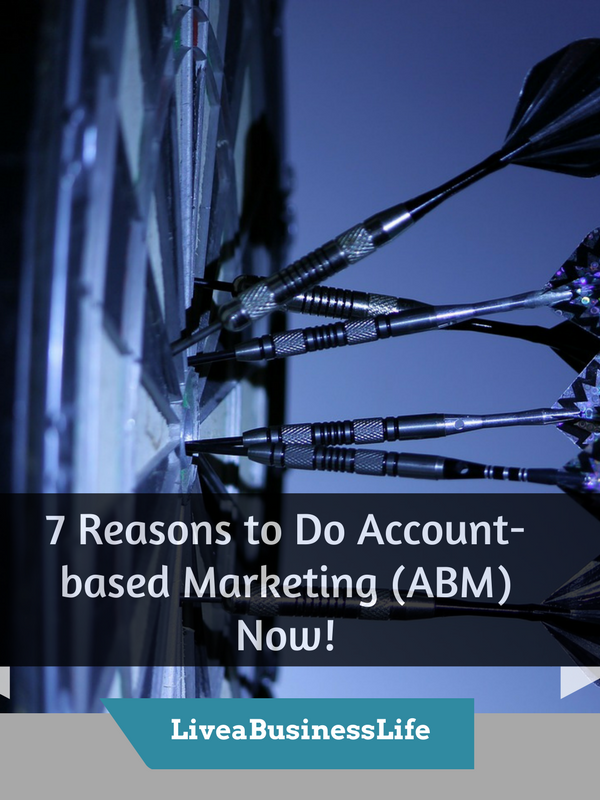 . . to support marketing activities aimed at achieving profitable acquisition and retention of customers… within a multi-channel buying process and customer lifecycle”. Neil Patel has also argued that digital marketing could be implemented offline or online. Any use of the electronic devices (CD/DVD, TV, radio, phone, etc.) for promoting your products or services could be considered offline digital marketing. However, the widespread use of the term “digital marketing” interchangeably with “internet marketing” has led to the acceptance of digital as internet. So when you’re reading an article about digital marketing trends, you’ll most probably not hear about typical TV ads, radios, or direct calls. This is Google Trend’s graph comparing digital marketing, emarketing, and internet marketing. So I think I’m quite justified in using digital marketing interchangeably with internet marketing, or at least focus more on its online side in my digital marketing strategy guide. In this article I’m going to walk you step by step through how to plan and implement a digital marketing strategy that ultimately boosts your sales. If one thing is to distinguish between digital marketing and traditional marketing, it is the advanced targeting and monitoring capabilities that digital marketing affords us. Whereas in traditional marketing, you had no option but to spread your ads blindly hoping that they will make way into the hearts of the right people, in digital marketing, you’re equipped with an unlimited set of demographic (e.g. age, location, job, income) and behavioral characteristics (e.g. preferences, problems, goals, challenges) to (re)define your ideal audience and target them. But apart from using common sense and guess work to define your customer personas (such as: the target audience for my ecommerce sportswear is athletic 18 to 25-year-old people), you should support your guesswork with research into customer segments. After all, having a vague idea of your ideal customers is one thing, truly understanding your audience based on data and analytics is another. You should also be always wary of the changes in your customers’ preferences and what they expect to get from you as the trends and opinions keep changing. Are you attracting the right kind of visitors to your blog? What are some pieces of content your audience is most interested in (from your site OR from your competitors)? Who is actually downloading your lead magnets? Are you narrowing down your leads timely so as to prevent excessive costs of advertising to the wrong people? Who is responding to your email campaigns and how to nurture them? Who is most engaged with your (or your competitors’) social media posts? I would like to go on and say that process of defining and understanding your customers is the most important step in implementing an efficient and solid digital marketing strategy. This said, you just can’t afford to spend your budget on hypothetical situations or immature game plans. You need to dig into the market, find out what your audience truly cares about based on solid data, and then implement the insights in your digital marketing strategy. So how can you understand your customers without venturing into the risky game plan of trial and error? One answer is doing a competitive analysis. Doing a good competitive analysis helps you identify the type of audience that the successful businesses in your niche are targeting. In whatever niche you are, there are typically always some powerful businesses that have been in the market for ages and know what audience to target after a great deal of trial and error. Good news is you can take advantage of their experience. Finding your path by following the steps of the successful businesses in your niche is the only way to ensure your success without having to go through a lot of failures. You can research the topic and read all the information provided by the veterans, but chances are some parts are by accident or purposefully omitted. So I think the best way to form a good customer persona based on the available data is to reverse engineer your competitors’ strategies by doing a competitive analysis and seeing what other similar businesses are doing. How to do a competitive analysis for a better customer understanding? You should know that keywords play an important role in the world of digital marketing. Search engines and social media algorithms look for relevant keywords to decide what content to show to people. Not surprisingly the content containing right keywords has a better chance of being shown to the searchers. Also a great way to find successful businesses in your niche is to search for some popular and competitive keywords. The websites that show up in the first page of the search results have typically higher authority in your niche and are successful in digital marketing. Generally the title of the niche is a high-volume competitive keyword that many big businesses target. You can also search for the high-volume competitive keywords by using tools such as Google AdWords Keyword Planner, SERPs’s free tool, Wordstream’s keyword tool, or Moz’s keyword explorer. 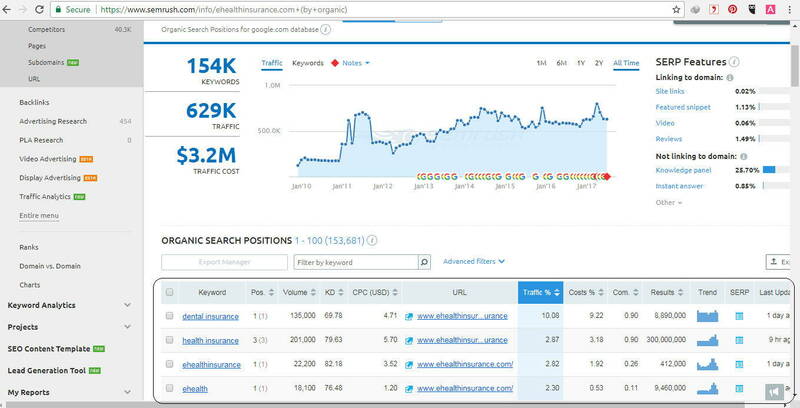 Here’s a screenshot from Moz’s keyword explorer used for the keyword “health insurance”. You can see that the keyword’s monthly search volume and difficulty are quite high. 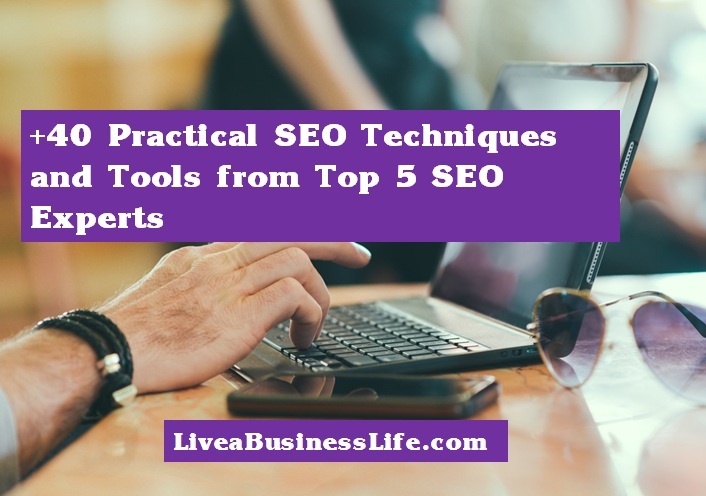 Other features of the tool include opportunity (relative click-through rate of the keyword for organic results), priority (a combination of different factors, the higher the better), keyword suggestions, and SERP (search engine result page) analysis showing the top pages for the keyword. Using Moz’s keyword explorer (or any other keyword tool) you can find the high volume, highly competitive keywords to search in Google. The companies that appear in the organic results of the first page are probably big companies with high authority in your niche — and therefore good cases for doing competitive analysis on. 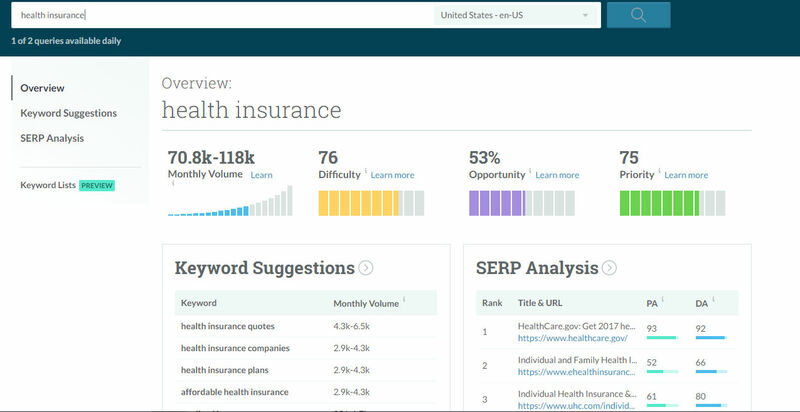 For example, searching the keyword “health insurance” brings up a number of pages in the organic search and the ads sections. 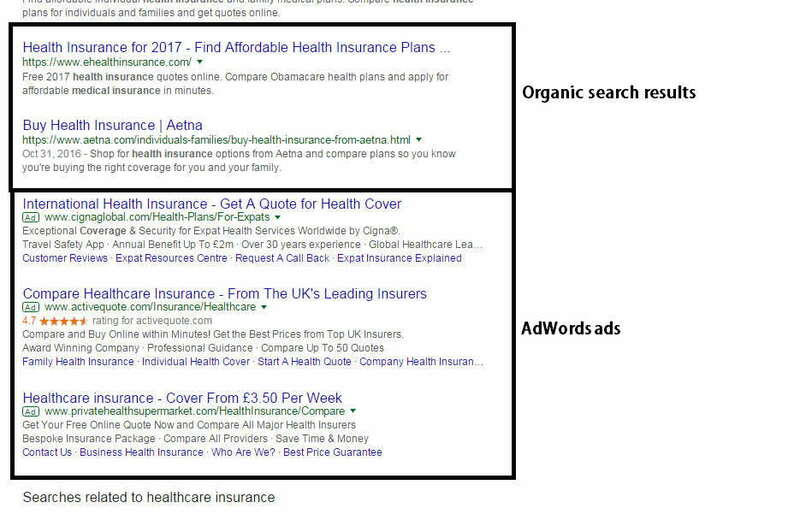 The fact that on the top and bottom of the organic search results you see many AdWords ads shows that the keyword “health insurance” has quite a high volume of search and as a result has more value. The appearance of many ads in the search results also indicates that the competition for the keyword is quite high and that ranking for it needs a great website authority, so probably the insurance firms that rank in the first page have done a great job in digital marketing. In the screenshot above there are two popular health insurance companies in the organic results: Ehealthinsurance and Aetna. The companies appearing in the ads section could also be popular but their authority in the niche is probably way below the authority of Ehealthinsurance and Aetna. Now that you could identify some great authority business competitors, it’s time to study their target audience and reverse engineer the companies’ strategies in dealing with their customers. There is no better way to make sure a strategy will work than to see it done by successful businesses. You can then find out their pitfalls and try to outperform them. I think the most important part of a company’s digital marketing strategy is how they curate content that attracts and engages their audience. Knowing the content marketing strategy of a successful business in your niche helps you understand your potential audience and what appeals to them. You can start with the most engaging piece of content of a website. In order to check the engagement of a piece of content, you can consider the number of social shares as a good indicator of engagement. To do this, you can use Buzzsummo. Open the tool’s website and enter a domain in the search box. In our example, Ehealthinsurance.com, you can see the most shared pieces of content of the domain. As seen in the screenshot, the most social shares belong to a blog post titled, “4 Myths about the Republican Health Reform Bill (AHCA), or American Health Care Act”. Also from the titles of the top shared content of the website, you can see that its audience are mostly interested in articles about the legal issues of health insurance. You can click on the links provided and go to the page and see the details. You can also see that the audience of this website is mostly active on Facebook, and conclude that Facebook is the most used social media platform for the audience of a health insurance company. However, it could also indicate that this particular website is mostly active on Facebook rather than other platforms, but anyway, it seems that Facebook is surely a great platform to engage with the audience of your health insurance company. These are the problems people are facing and are actively trying to find solutions for. Knowing what keywords your successful competitor targets helps you identify your potential audience’s pain-points and needs. To do this, you can use SEMrush. Simply enter the domain and find out the targeted keywords and the website’s organic search positions for them. There are also some tools such as versionista or visualping for monitoring the changes that occur in a website or a specific page. Any changes in the content or layout of your competitor are worth tracking. What problems does the content aim to solve? What specific pieces have got the most social shares? What kind of giveaways work well? How does the content convince the audience to buy? What content is being included in the newsletter? Remember to sign up for the newsletters of many successful businesses in your niche. 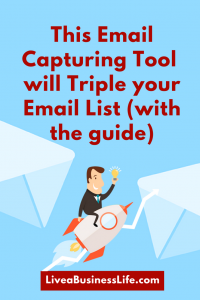 This gives you a better understanding of what to send and how to write attractive titles and increase the CTR (click through rate) of emails. You should have a good grasp of your potential customers once you answer the above questions. Remember that planning and implementing your content marketing strategy demands a high level of understanding of your customers. Successful businesses in the similar niche could be a great source for understanding the potential customers of your business. Most companies that are savvy in digital marketing are also great in finding out what ticks their customers on social media. By monitoring how the audience of a successful business responds to its social media activities, you can form a good understanding of your own audience. See what posts elicit the most engagement (number of shares and comments) and try to create similar ones. Find out the people who follow a successful business, connect with them, and study their characteristics. Then reach these people using social media targeting options (more on this later). There are some ways to monitor a business’s social media activities. You can connect with/follow them on each platform and directly monitor how they represent their brand and how their audience responds to their content. You can also use social media listening tools such as Talkwalker, Mention, Awario, etc. 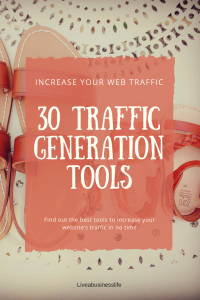 Each one of these tools enables you to track some keywords. You can track the name of a successful business in your niche and see what people are telling about them across different social media platforms. Or you can track the name of a product and service and find out people’s sentiments about it. Even in some cases, while tracking the name of a competitor or the name of a product, you might stumble upon a complaint by an unsatisfied customer. You can take advantage of this situation and reply to that person with an offer to replace the unsatisfactory product or service. What kind of posts get the most engagement (comments, shares)? What are the most frequent issues addressed? What are some general characteristics (demographic or behavioral) of the followers or connections? How many times a day a new post is published? What multimedia files get the most engagement? What are some of the customers’ pain points that are not addressed appropriately? 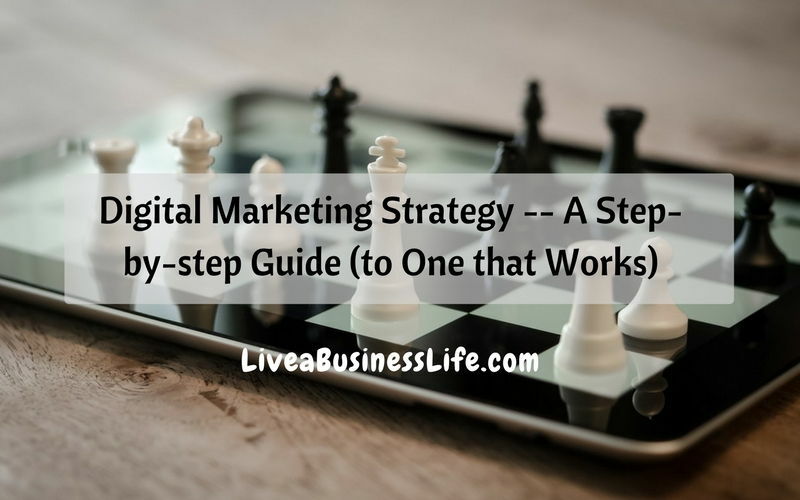 Step 2 of our guide to a solid digital marketing strategy is when you plan your strategy. After doing a rather rigorous study on your potential customers, it’s time to decide how you want to gain profit. A new business around might need to increase its customer base by first selling in lower prices, or offering prizes that could be really costly to the business at first. A good example of this kind of growth plan is Paypal. The company could raise its customer base to 100,000 people in its first month by offering people costly prizes: 20$ if they opened an account and 20$ if they referred any one. This costed Paypal $60 to $70 million, but it was totally worth it. In contrast to this, a B2B company might not need a lot of customers as its target audience is much smaller and its product value much higher. However, in most cases a company might decide to have an improvement in all the three areas. It might decide that it can charge more by improving the quality of its products, or increase the number of transactions by offering similar products or services as upsells or cross-sells, while at the same time try to increase the number of its customers. There are some digital marketing tactics for each of the three areas. However a solid digital marketing strategy is a holistic approach that takes care of all three areas although it might focus more on one area. Here are some tactics with a focus on each area of business growth. It goes unsaid that none of these tactics will be effective on their own but will drive the wanted results only when incorporated in a well-designed sales funnel. For example, SEM (search engine marketing) or SEO (search engine optimization) will never have the desired results if your blog’s visitors are not captured as leads and nurtured (through email, retargeting, social media, webinars, ebooks, . . .) until they turn into customers. It is worth mentioning that there is no clear distinction between the uses of these tactics. Content marketing might be a good fit for improving awareness about your business and driving more potential customers to your blog, but it’s also a great way to convince people to buy more frequently or in greater amounts. Or sometimes turning a visitor into a one-time customer demands a great deal of email marketing, mobile marketing, retargeting, etc. And again these tactics have the desired effects only when used in conjunction with each other. But it happens that because of some reasons such as your business’s age, type (B2B or B2C), or the number/value of your products (as mentioned above), you have to plan a digital marketing strategy that focuses on one area of business growth. For example, a new website that offers content marketing services needs to grow its customer base for a while, so it focuses on tactics that increase awareness and convert its website’s visitors into customers. 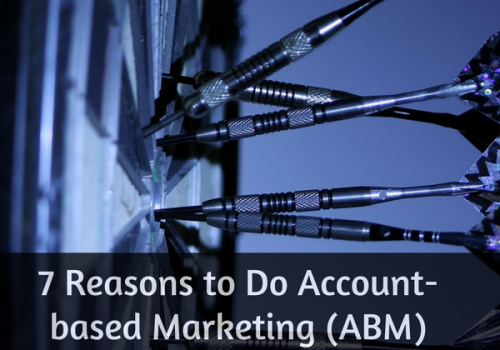 It could focus more on ranking for some relevant keywords, doing social media advertising, cold emailing, etc. But after reaching the ceiling for the number of customers, the website understands that it cannot support any more clients due to the limits on resources (technological resources, human resources, etc.). So it decides to put off increasing its client base and focus more on delivering quality services to increase the transaction value and frequency. So it totally makes sense to me that a digital marketing strategy could be focused on one of the three areas of business growth (increasing customer base, increasing transaction values, increasing transaction frequency) for a while. After understanding your potential customers and determining how you want to grow your business, it’s time to learn more about the actual tactics that comprise your digital marketing strategy. These tactics are used in a framework called the “sales funnel”. 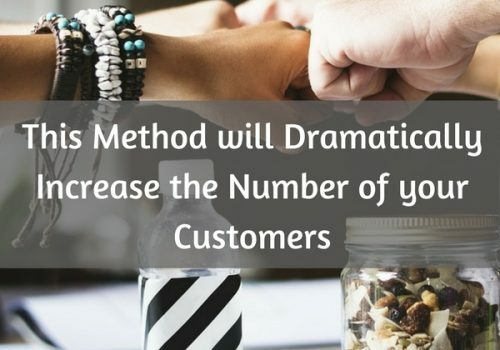 In the process of turning your visitors into loyal customers, each of these tactics should be implemented in a specific time and place and in relation with each other. Using a sales funnel guarantees that each of these tactics are used efficiently. As understood from the term, a sales funnel is a process that narrows down the number of prospects that interact with your business through different phases, and turns them into customers. Awareness: the prospects become aware of your business and get interested in your products. You take their contact information for the nurturing phase and your prospects become your “leads”. Nurturing: the leads are not yet ready to purchase from you, so you try to convince them you are worth the money through their contact info. Purchase: your leads are convinced that your product is a good solution for their problem, and they buy from you. This is of course a general understanding of how a sales funnel works — a lot happens when a prospect should turn into a customer. Even after people pass your sales funnel and turn into customers, you cannot leave them. 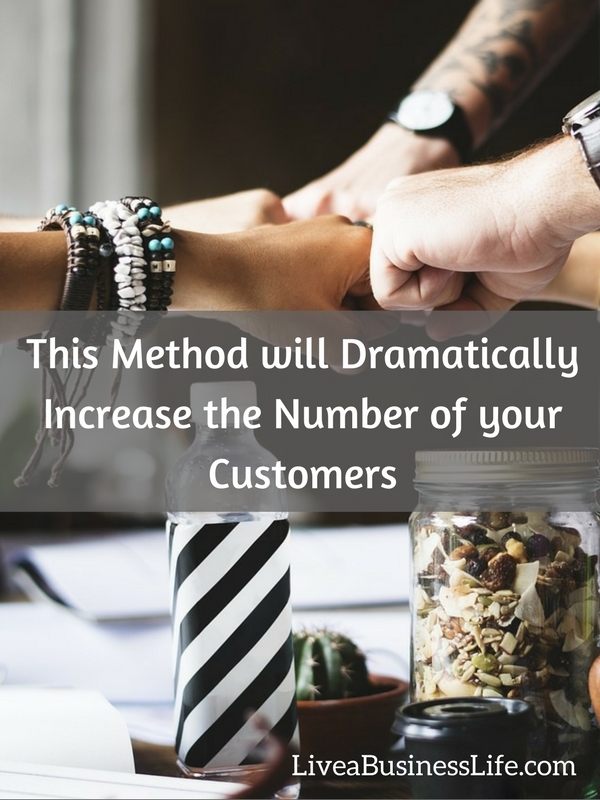 You need to turn your one-time customers into loyal ones who are ready to purchase in more amounts and frequency. Determine product/market fit based on how you can solve people’s problems and transfer them from the “before state”, the state of pain or problem, to the “after state”, the state of satisfaction. Choose a traffic source from the six possible ones (i.e. email, social media ads, banner ads, blogging, organic social media, SEO). First master one and then go on to work on others. Offer a lead magnet that captures people who are interested in your main products or services. Offer an ebook, webinar, e-course, etc. in return for people’s email address. Offer a tripwire. Tripwire is an irresistible, super low-ticket offer (usually between $1 and $20) that exists for one reason and one reason only … to convert prospects into buyers. Examples of tripwires are ebooks, physical products, special offers, etc. Offer your core product to people who have bought your tripwires. You can be quite sure that they will buy it. Offer a profit maximizer. You can increase the value of each transaction by offering related products (cross-sells) or the products that complete the core product (upsells). Profit maximizers might be the main profit avenue if offered appropriately. Create a return path. You can do the previous six steps with other lead magnets, tripwires, core products, and profit maximizers. Just make sure that your current customers keep buying from you. The seven steps mentioned above say the final word in the idea of sales funnel. The customer value optimization model almost has it all, so no need to go any further in explaining sales funnel. Let’s get down to explaining the tactics used in a solid digital marketing strategy. Out of these six ways, search engines can give you the most consistent and qualified traffic. Search engine optimization (SEO) is a set of practices that finetune your blog for more organic traffic from the search engines (read Google). 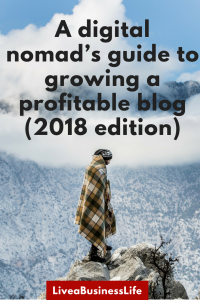 Once you technically tweak your blog for ease of access by Google, you can set your goals and target an audience that is interested in your content. If you’re using WordPress as your content management system (CMS), you can leave the technical side of your SEO to some plugins such as Yoast or All-in-One SEO. Apart from sorting technical SEO issues such as meta and link elements, XML sitemap, RSS optimization, .HTACCESS and ROBOTS.TXT files, etc. 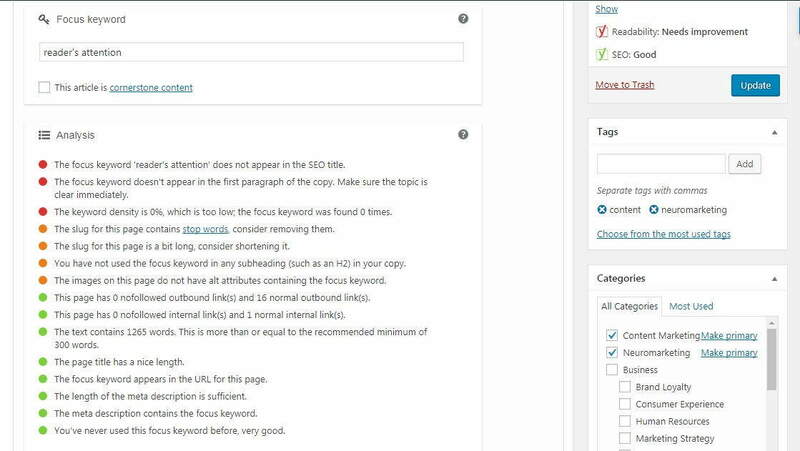 Yoast plugin analyzes your content for readability, keyword focus, and some other on-page SEO issues. Here in the screenshot you can see Yoast’s analysis box that gives you warnings on various on-site SEO issues. Yoast also shows how your page is seen in the search engine results page (SERP), and allows you to edit the meta description. Every time somebody searches for a specific keyword, Google’s algorithm searches for the keyword in its indexed pieces of content. 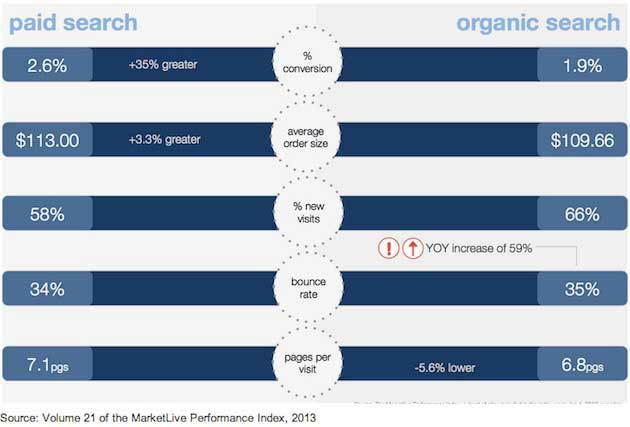 Then according to different ranking factors, Google shows the most relevant pages. So in order to target the right people, you should target the right keywords. In order to find the right keywords, you could reach out to people and see what they’re really interested in about your topic. You can enter your head keyword in keyword tools such as Google AdWords Keyword Planner, SERPs’s free tool, Wordstream’s keyword tool, or Moz’s keyword explorer, and use the suggested keywords. But this method will most probably give you the medium/long-tail keywords that contain your head keyword. 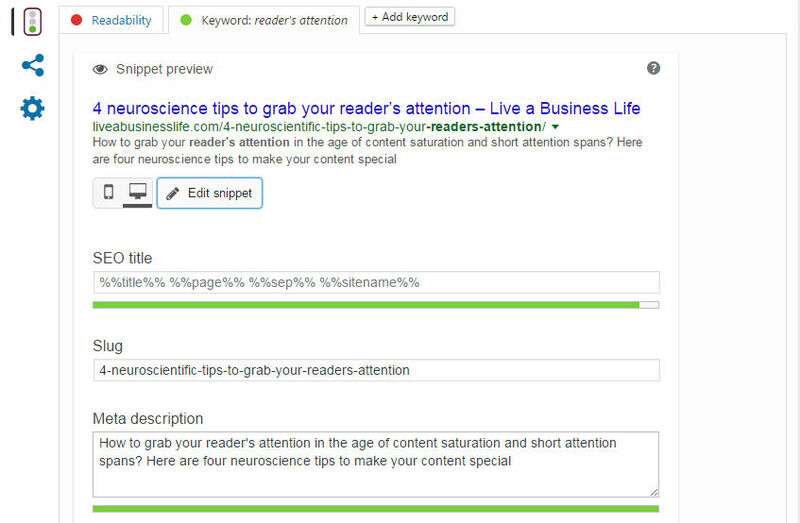 Even if not so, the keyword tools suggest the same keywords to everybody. You can search your head keyword in Quora, Reddit, or Tumblr and find out the recurrent medium/long-tail keywords. To do this type this search query in Google: site:quora.com “keyword phrase”. This will show you all the pages that contain your keyword. Click on any question and see the answers. Apart from finding the long-tail keywords, you can find the related keywords. You can search other social media platforms such as Twitter and LinkedIn to find the recurrent and related keywords. You can check out Google’s suggested keywords when you search for a head keyword. You can also look for the long-tail keywords in forums. First search for the forums in your niche (searching keyword + forum), and then search through the forum by searching “site:forum URL “keyword” in Google. 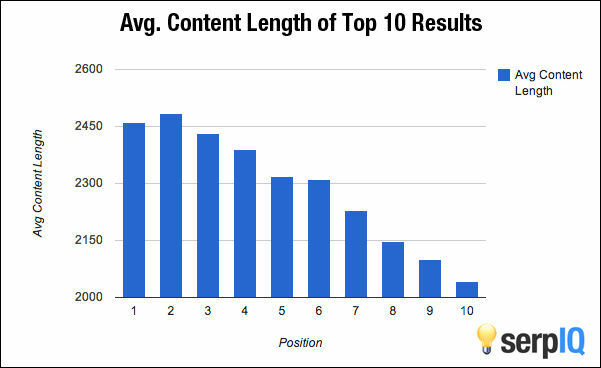 Content length: According to an analysis by SERPIQ , the results in the first position of SERPs had the average of 2450 words. So probably quality content should be around the same number of words. 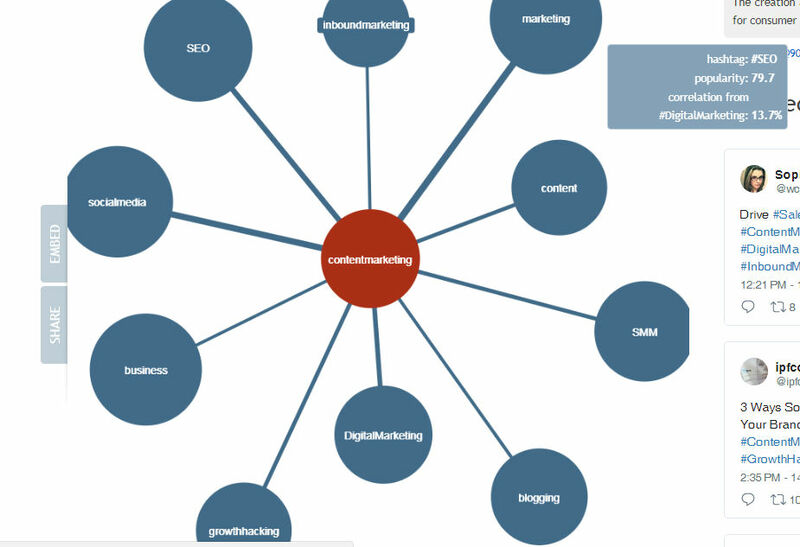 Latent Semantic Indexing (LSI) Keywords: LSI keywords are related to your main keywords. For example when targeting “digital marketing strategy”, you should also use some related keywords such as “SEO”, “social media marketing”, “email”, etc. This way Google can better identify what your content is about. Now because quality content is long, it has more LSI keywords, right? Internal and outbound links: internal links are the links you give to the content on your own website, and outbound links are the links you give to other blogs. More internal links to the similar piece of content on your website could indicate its high quality. 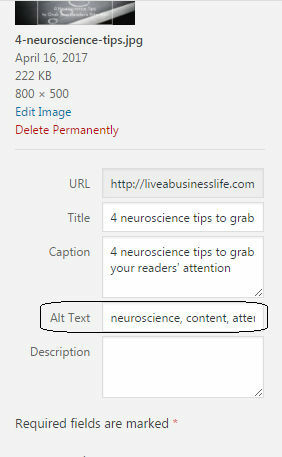 Also giving more outbound links to the similar content on authority blogs indicates what your blog or piece of content is about. Now, longer pieces of content, probably have more related internal and outbound links right? But remember too many links could negatively influence your ranking as they disrupt the reading experience. 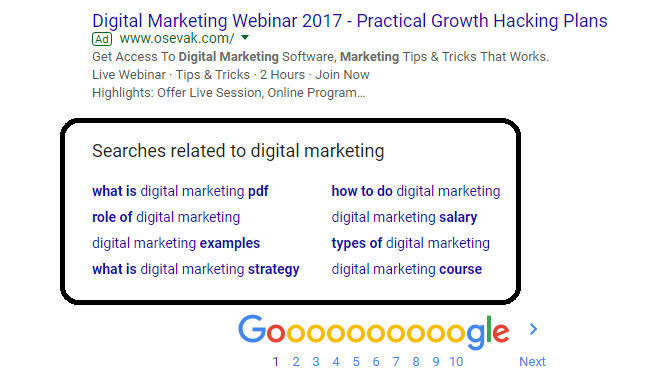 Click-through rate (CTR): more clicks on your content when appearing in the search results could be a positive factor in ranking. It shows that your content is more relevant. Higher CTR means that your content is considered more valuable by users. Dwell time: the time span between the click that opens your page in the search results, and the click to return back to the search results page is also important in your ranking. More dwell time could mean that your content is more engaging for users and so they’re spending more time on it. Inbound links (backlinks): simply said, more links to your content from other high-authority blogs means that it’s valuable. 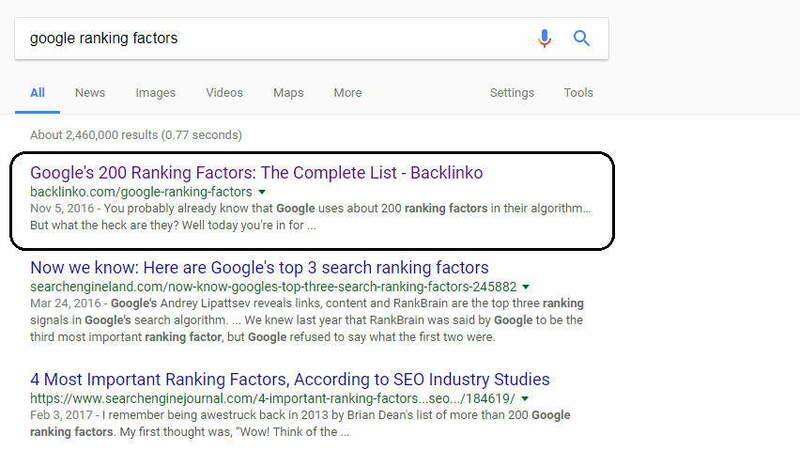 This factor is very important in your ranking and each inbound link could mean an extra positive point in your ranking. ALT attributes: the descriptions you should give for pictures. You can modify the Alt texts for your pictures when uploading your pictures or through your media section in WordPress. There are two kinds of backlinks: no-follows and do-follows. The difference is no-follow backlinks have no influence on your ranking, but do-follow links boost your ranking. The point is some black-hat SEO people try to get backlinks by publishing spammy content on many websites. Google knows that these spammy links are not worthy and so does not count them as a positive factor in ranking. No-follow links are bought links, links in comments, Wikipedia, forums, or in any content that is “untrusted” by Google. Do-follow links with appropriate anchor texts from good domains, on the other hand, give you authority on the topic. Finding broken links on a website (using Broken Link Checker extension for Chrome) and offering your content instead. Using the SkyScraper technique. Brian Dean explains that you can find the link-worthy pieces of content (using ahrefs, and Buzzsummo — these tools can show you the most popular blog posts of a domain), find blogs that have given backlinks to them (using ahrefs), create better content by updating or extending them, and then send an email to blogs webmasters or editors and offer your updated or extended piece of content to replace the outdated one. Today, search engine marketing (SEM) is equivalent to search engine paid advertising. 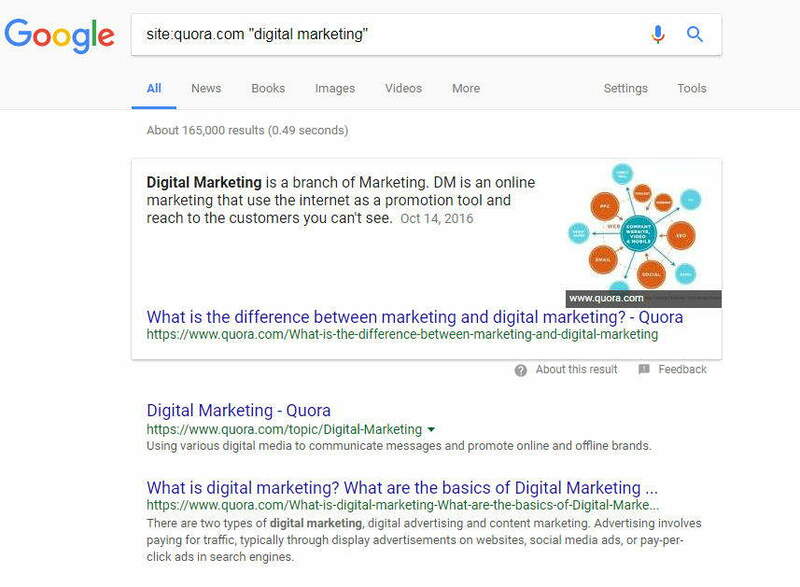 When you search for a query in Google, apart from the organic results, you might see a group of ads in the SERPs (search engine results pages). Advertisers can use Google’s AdWords program to select target keywords, set their daily budget, write their ad’s content, and provide the link to their landing page to easily set up a PPC (paid-per-click) campaign. However, Google does not promise to show your PPC ad every time somebody searches for your target keywords. It has its own criteria. There might be lots of people targeting the same keywords as you. Every time somebody searches for the keyword, Google holds an ad auction to decide on which ads to be shown and in what order. Now, in the auction Ads compete based on their assigned ad Ranks. Ads with higher ad ranks get the most exposure. So it’s a great idea to improve your ad’s ranking to get the most exposure. Your ad’s CPC bid: cost per click or your maximum bid for an ad. Higher bids increase your ad’s rank. Your ad’s quality score : a metric that depends on the history of your ad’s click-through-rate (CTR), keywords relevance, and landing page relevance. Try to use appropriate titles and descriptions, and provide relevant high quality content to convert your visitors. Although many people would say that paid per click advertising is not as effective as organic ranking, its is quite obvious that when done right PPC could have great results. The greatest merit of PPC ads is that they are shown only when some specific queries are searched for. For organic search, your content might be shown for a keyword you were not targeting. 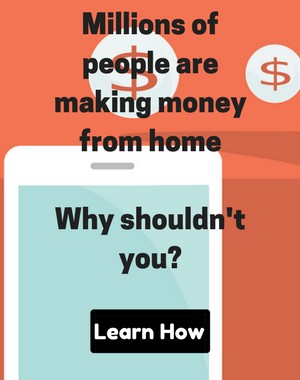 This drives the wrong traffic to your blog. However, PPC ads drive more qualified traffic to your website because you set the exact keywords first and only when people search for your selected keywords, your ad appears. A report published in 2013 by Marketlive, a former ecommerce service provider, now part of Kibocommerce, showed that the conversion rates for paid search visits to e-commerce websites are 35% higher than organic search. This might be due to the fact that Google offers a great targeting toolkit (e.g. 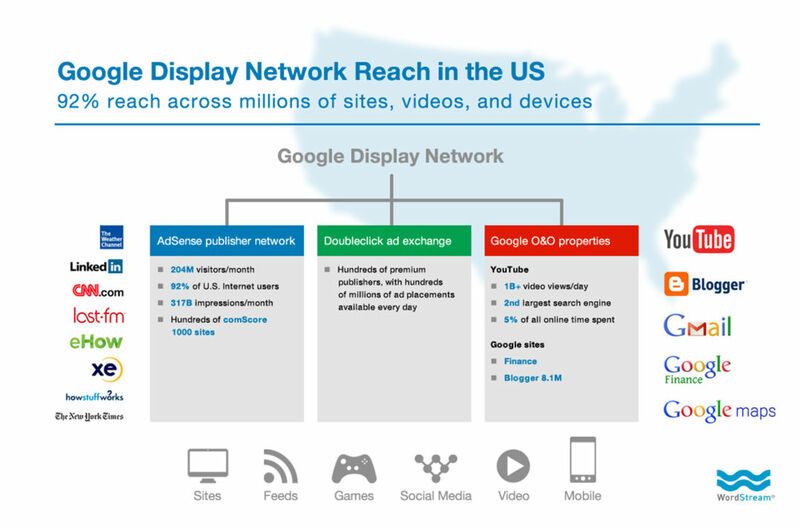 exact keywords, location, demographics, devices, etc.) for its PPC campaigns. Therefore people that visit the website by clicking on the PPC ads are already more interested in your offers. According to Content Marketing Institute content marketing is a strategic marketing approach focused on creating and distributing valuable, relevant, and consistent content to attract and retain a clearly defined audience — and, ultimately, to drive profitable customer action. The definition says it all. In today’s world of marketing there’s no point in offering your product right off at the start. In order to “drive profitable customer action” you need to convince people that you care about them and have an answer for their problem. And content is the game plan here. Nothing can convince people to buy from you better than a genuine piece of content that helps them with their problems. Without much further ado, let’s begin our mini-guide on content marketing. As you see these are the stages of a sales funnel (see above) and in every stage there is need for good content. That’s because digital marketing primarily happens through content. 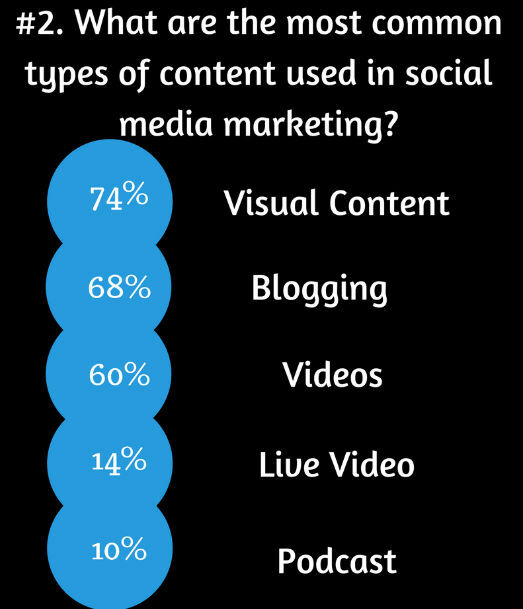 So content marketing is integral to every tactic in your digital marketing strategy. From understanding your customers and planning your strategy to implementing the tactics, your ultimate goal is to curate suitable content for your customers. But how should you do so? Do you know your customers? Their needs and pain points? If no, go through the step 1 in this guide to define your customer persona(s). If yes, then you probably know what topics to write about, what issues to address, and what solutions to offer. To raise awareness about your business provide some cornerstone content, some comprehensive introductory blog posts (like this blog post you’re reading). These are the blog posts you want people to read first thing when they enter your blog. Don’t be advertorial and just try to give an overview of the problem and its possible solutions. Make them long (above 2500 words) with lots of headings and optimize them for head keywords. Write separates blog posts on its different headings later, provide backlinks to your cornerstone content (internal and external) whenever possible, and try to update them regularly. To capture your visitors as leads, provide lead magnets: some irresistible simple offers (ebooks, videos, webinars, worksheets, blog posts, . . . ) that your visitors receive in exchange for their contact info (e.g. email). Your lead magnets should be specific because the wrong lead magnet gives you unqualified leads. Here is my lead magnet, an SEO ebook. Keep producing quality content and don’t rush to update your blog with low-quality articles. For most bloggers, it takes 1-2 hours to create a blog post. For seasoned bloggers that know the value of indepth articles, time limits don’t matter as long as they’re creating valuable content. As an example, consider Brian Dean’s Backlinko. It’s monthly traffic is nearly 1 million, but how many blog posts do you think he’s got? 38 or so, and he’s been around for years! However, he keeps updating his current blog posts and adding value to them like crazy. The results? His articles rank in the first page for almost any valuable SEO keyword and they’ve got lots of shares. Consider this one for example. 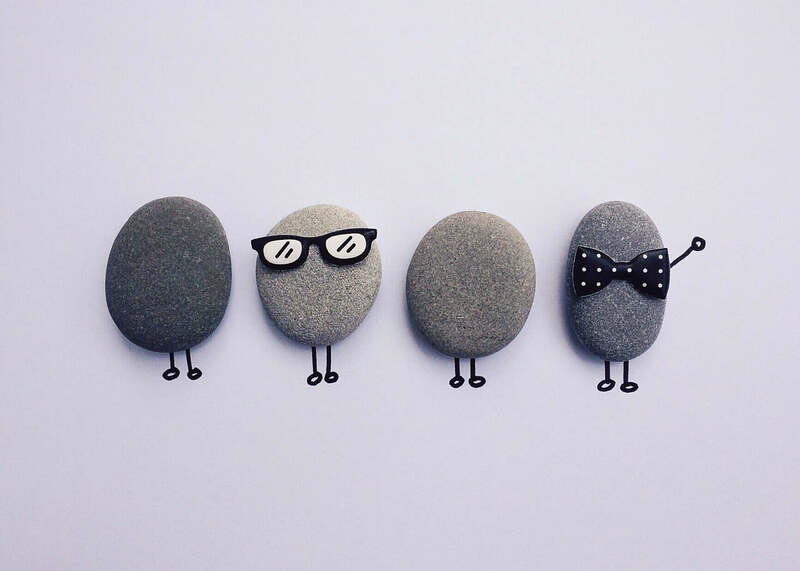 Use different types of content. Content marketing is not just about writing boring blog articles or ebooks. There are infographics, (live) videos, podcasts, interactive content and probably more. I make infographics from time to time and share them on Pinterest, and you know what? They get the most shares. Here is the kind of content most used on social media. You will not run out of content ideas if you do a good research for your cornerstone content. Because you have to research about and include a broad range of topics in your cornerstone content, you’ll have a list of topics to expand upon later. As you go on in researching and writing your cornerstone content, jot down the topics, sources, statistics, ideas, and whatever that will help you produce content, and use them later. When you first start off your blog, your only free source of traffic is social media. True you’re writing optimized blog posts for organic Google ranking but it at least takes six months to be effective. It might seem overwhelming but even if you have the greatest linkable content on your website, you need to do a lot to amplify them. You need to take the word out and let people know that they’re missing a lot if they’re not reading your posts or giving backlinks to them. Using social media is your winning ticket. It’s free and effective, and it teaches you a lot on the way. To convince you that social media marketing is actually worth a big shot, I can mention Statistica’s jaw-dropping report on the number of Facebook’s active users worldwide since 2008. 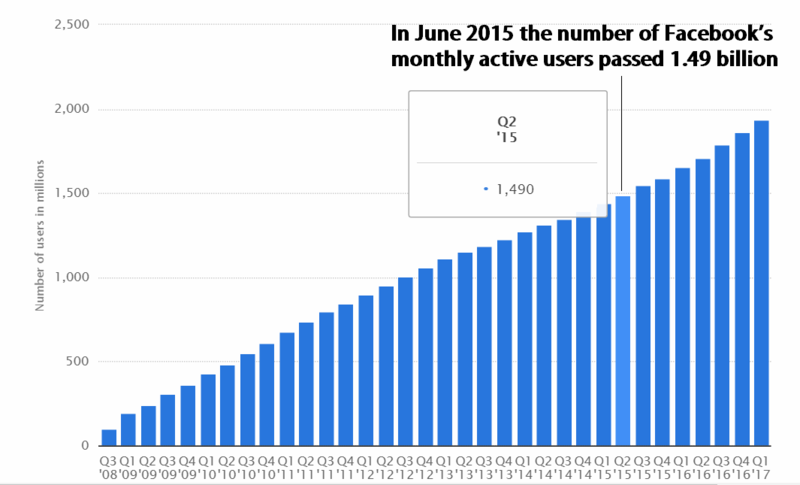 According to the graph the number of Facebook’s monthly active users passed 1.49 billion in June 2015. As for March 2017, it was nearly 1.936 billion. Quite a big deal huh? However, managing your social media accounts could be time-consuming and on occasions impossible. You could spend your whole working hours on social media and get nothing done. Using social media management tools could be a wise move. There are lots of different social media management tools — just search the keyword and you’ll see lots of them. 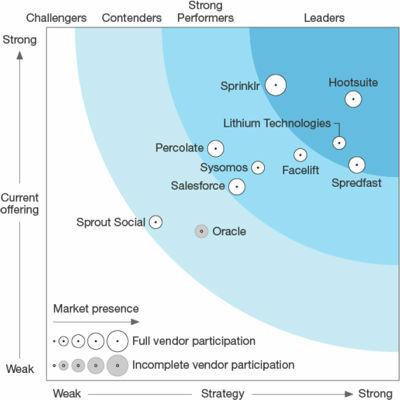 But according to Forrester’s report “The Forrester Wave™: Social Media Management Solutions, Q2 2017”, Hootsuite is a top leader in social media management solutions (SMMS). In its free plan, Hootsuit’s greatest merit is content scheduling and RSS feed integration. 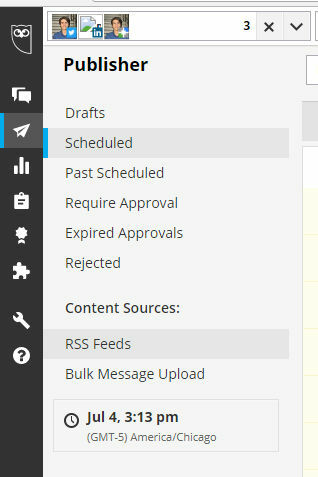 Of course there are limits in the free plan (content scheduling is limited to 20 posts, and RSS integration is limited to two websites) but that shouldn’t stop you from using it. Register for the free plan, open your dashboard, and add your social media accounts (up to 3 in the free plan). I have added my Twitter, LinkedIn, and Google+ accounts. Then add streams for each one of your social media accounts so that you can have full control over all of them from your dashboard. My Twitter account has four streams (Home, My Tweets, Scheduled, and Retweets) as you can see in the screenshot. 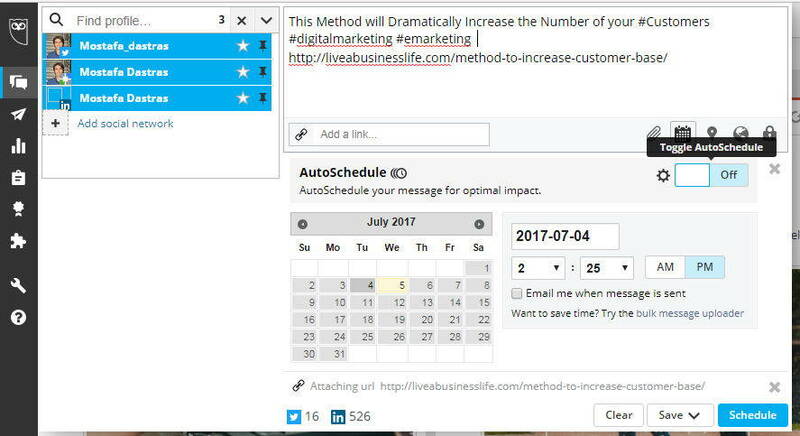 You can auto-schedule your posts on all of your social media accounts at the same time by pasting your message and its URL in the box above the screen. Then select the platforms you want to share your content on. Then click on the schedule tab and toggle on the auto-schedule option. Then click “AutoSchedule”. You can also change the number of times auto-schedule function should share your posts a day or even its time range, from Settings. Another great feature of this tool is its RSS feed. 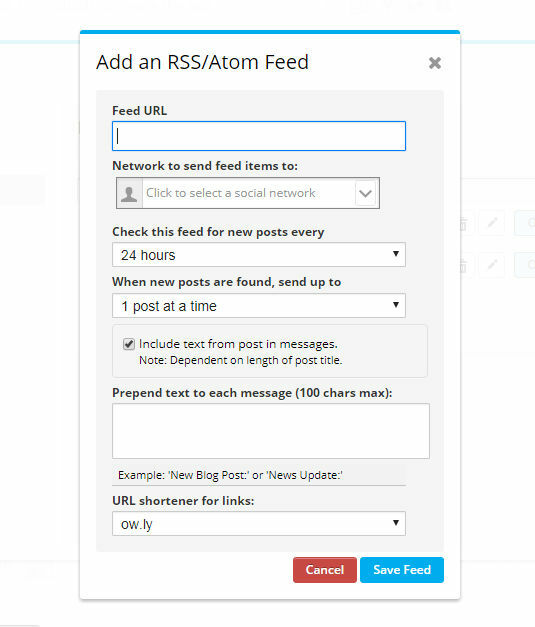 You can paste the RSS URL of a blog and then every time it’s updated, the post will be shared on your selected platform automatically. Head to the Publisher, then RSS Feeds. Then click on the + (plus) button to add your RSS URL. Select your preferences and then click “Save feed”. 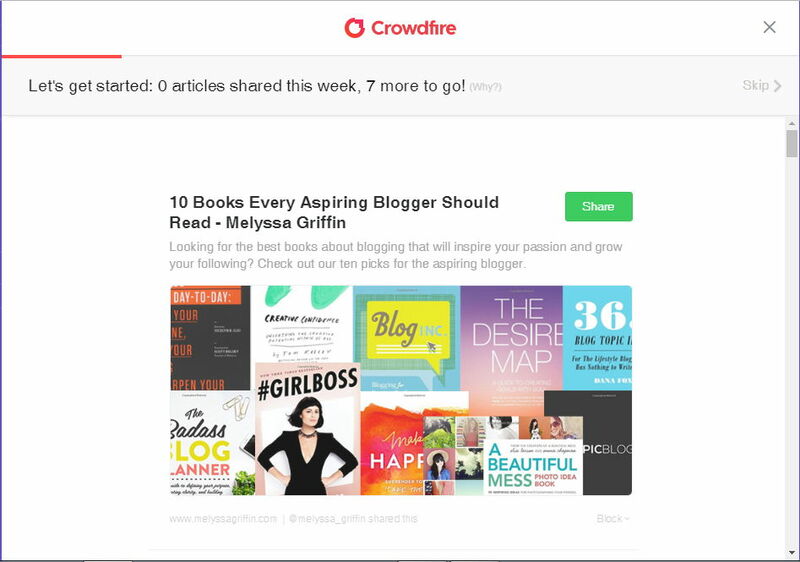 You’re all set to automatically share the posts of your favorite blog on your social media accounts. 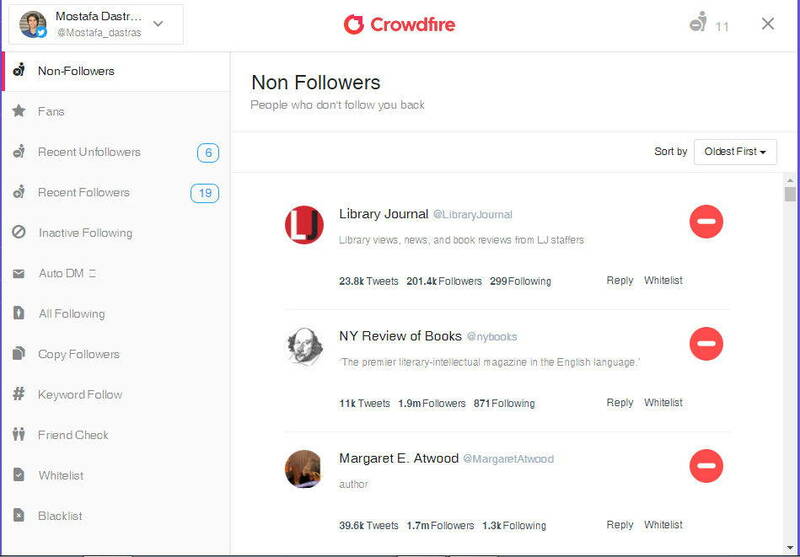 Another great free social media management tool is Crowdfire. It’s great for growing your audience especially when you’ve just started your social media presence. One of the greatest features of this tool is its smart feed content suggestion. All you have to do at first is to set your topics and preferences and then the smart feed suggests the most relevant content from around the web. You can then read the most attractive ones and autoschedule them on your accounts. The tool also offers great “Twitter Growth Features” where you can manage and grow your followers. The problem with social media is that with all the content being shared on social media platforms (Facebook, Twitter, LinkedIn, . . .), and each platform’s algorithm that sifts through the content to show the most relevant ones, organic reach on social media has declined (See this infographic). When you share something on your social media accounts only a percentage of your connections/followers get to see them. The solution is using social media ads/promoted content. The targeting options of social media ads/promoted content enable you to reach your ideal audience. Then an advertiser could easily define his exact target audience based on these options and be quite sure that his ads are targeted to his ideal audience (the fact that they are displayed to the targeted audience or not is a different topic, we’ll discuss this). 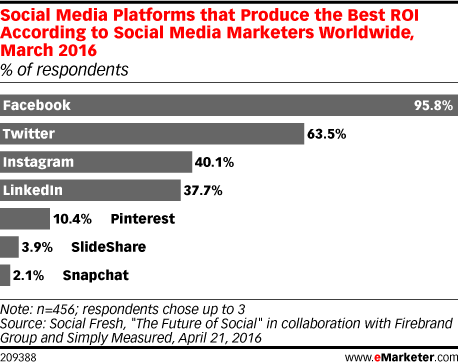 According to a survey done by Social Fresh, Firebrand Group and Simply Measured (accessed from emarketer), 95.8% (out of 551) of marketers worldwide believe that Facebook brings the most ROI to their company. Twitter, Instagram and LinkedIn were the next places. 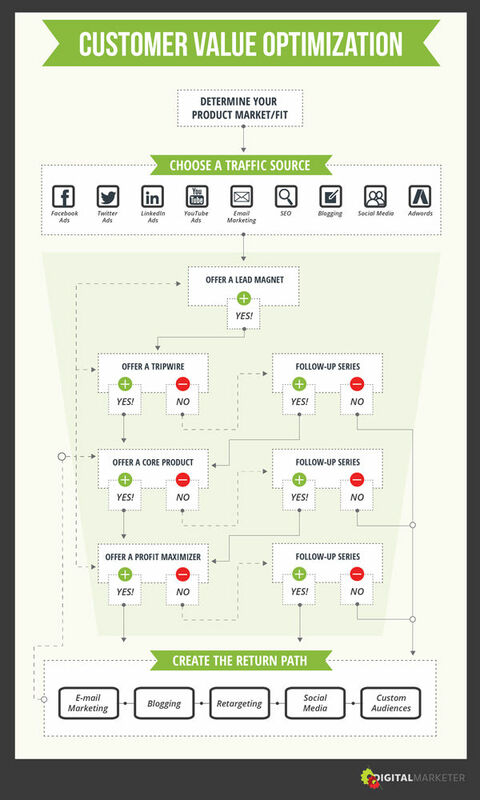 Setting up your social media ads is a similar process in almost any platform. You set up a campaign, select your audience and targeting options, set your budget, and create your ads. However, there is no guarantee that your ads are shown to the full potential audience. Even your promoted content should have the minimum level of engagement to be considered worthy of being shown by social media algorithms. A piece of content with the highest bid might seldom get shown because of its irrelevance or lack of good engagement history (previous likes, comments, shares). On the contrary, an ad with a lower amount of bid but higher quality and past engagement might get displayed to more people. Optimizing your ads for quality and relevance is really important. Limit the Scope of your Target Audience: Your ads will have the most ROI when they are shown to a comparably small audience. When defining your target audience, try to consider as many defining factors as possible so that your audience size is specific enough. Boost your Content’s Engagement by Optimizing your Content: Social media platforms assign a quality score to your content based on your content’s relevance (according to its keywords), and past engagement (people’s likes, shares, and comments). This quality score, alongside your bid, has the final word on whether your content should be shown to your potential audience or not. Try to incorporate the right keywords in your content so that the social media algorithms would consider them relevant. Also make your content both attention-grabbing and useful. Provide a Seamless Experience across Various Platforms and Devices: You should know what content your audience expects from you in every platform. For example, while Twitter is a great platform for promoting short texts such as news of your upcoming events or products, LinkedIn is a place for showcasing your expertise through various articles. Videos on Youtube, rather than Twitter, have higher conversion rates, and personal stories might have better influence on Instagram and Facebook. The same is true with your customers’ preferred actions on their various devices. While they may be interested to engage with your content through their mobile devices, they might prefer to complete their buying process through their PCs. Social media mobile targeting options allow you to show specific content on different devices. Trusted third-party recommendations always do the trick. In order to use the trick in your digital marketing strategy you have two ways: either convince people with a relatively smaller audience (30,000 or fewer followers, micro-influencers) to recommend you to their friends, or use social media influencers to promote your content. Both ways could be considered influencer marketing. Influencers in a niche are the people trusted and admired by a lot of people in that niche. Think of them as Hollywood celebrities in their own specific niche. These people have the power to influence other people’s decision-making and as such businesses could use them to boost their sales. These people don’t necessarily have to be important people or famous celebrities — anyone with a fair number of followers (more than 5000 according to the video) and a good authority and influence could be considered an influencer. And they can really help you with your business. 49 percent of consumers seek purchase guidance from social media influencers. 20 percent of consumers say that a Tweet from an influencer inspired them to share their own product recommendation. 40% of Twitter users say they’ve made a purchase as a direct result of a Tweet from an influencer. Depending on our niche or the aims of your campaign (driving traffic, lead generation, demand generation, purchase, .etc.) you can identify and select the right influencers. One way to find the right influencer for your business is monitoring your niche’s popular hashtags and finding the people who have the most activity around them. You can then see the number of their followers and their level of engagement (likes, shares, comments) to find your fit influencer. 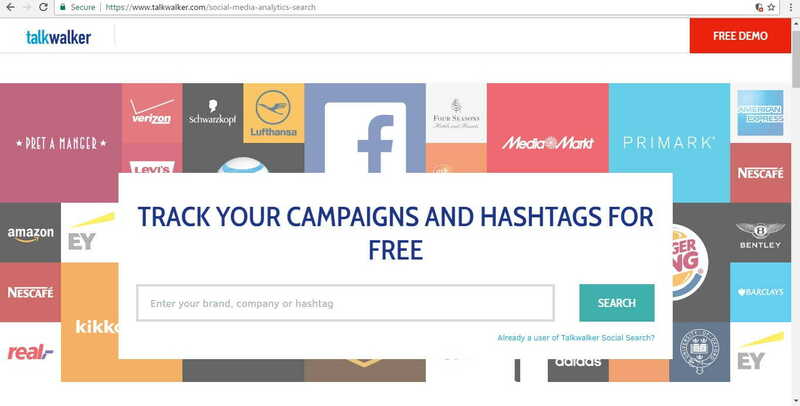 To research your hashtags you can use hashtag tools such as Right Tag, Trendsmap, Twitonomy, or Hashtagify.me. Buzzsumo is a great digital marketing tool with many functions. One of its great functions is its Twitter influencer search. Go to the “influencers” tab and search your topic. You will see a list of influencers with their reach, authority, and engagement factors. Klear is an influencer marketing platform that enables you to find social media influencers based on their skills and locations. Its influencer research option allows you to analyze any person (including yourself!) on social media for various factors such as audience demographics, engagement, influence, etc. Other influencer marketing platforms have quite the same function for analyzing an influencer’s reach, influence, and authority. You can simply search them on Google to find good ones. Be sure that your selected influencer typically shares the kind of content you’re asking him to share. This way your content will look less branded and more natural. It’s a good idea to leave content curation to influencers themselves as they know what content is appealing to their audience. For most of the influencers a good compensation is your brand’s authenticity and relevancy. Money is also a good incentive but no influencer is reckless enough to endanger their reputation with crappy or unfit products no matter how much they’re paid. Use micro-influencers for a more targeted follower base or more conversion rate. Micro influencers are people with a typical number of followers. However, because most of their followers are their friends, they might have a better influence on them. People are more receptive to recommendations from friends. Before I start my mini-guide on email marketing, let’s take a look at Content Marketing Institute’s Top 3 Email marketing tips for 2017. You’re probably receiving lots of of promotional emails everyday, so I don’t need to tell you what email marketing is. What I do need to tell you is that you don’t open most of the emails you receive everyday because they all look alike, they’re all promotional. Yes, the problem with email marketing is that it has a low open/click-through rate (20% and 2.5% respectively). Or maybe these are not the KPIs we should track. How many of the people who have opened your emails actually buy from you? This is while according to Direct Marketing Association’s 2015 response rate report, direct mail outperforms all digital channels combined by nearly 600%. You heard it right: in the age of digital technologies, people respond better to letters rather than emails. Any ideas on why it’s so? My guess is that the reason is people are not receiving lots of direct mails these days so marketing through direct mail is less competitive than email. On the other hand, we’re all seasoned to take it for granted that most of the emails we receive are less than their words — in this case less than their titles. How many times have we read a blog post urging us to write catchy email titles just to improve the open rates? 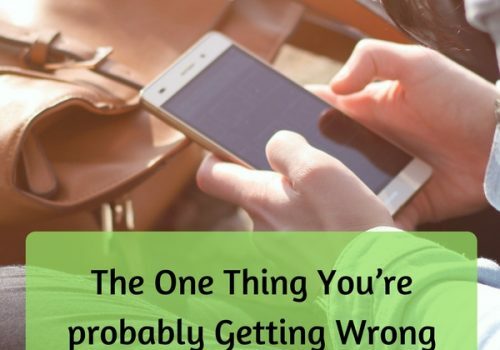 You’ve almost forgot that unless the content of an email is as catchy and as interesting as its title, writing a catchy title for it has a negative effect. It’s just one step forward in proving that you’re inauthentic. On the contrary, if you’re sending interesting and relevant content (e.g. a timely offer) in your emails and write a title that neatly describes what is inside, then you have higher click-through-rates and higher purchase rates from emails. Simply because email marketing is easy we shouldn’t fall into the trap of sending crappy emails. In general when people advise you to write catchy titles just to improve your open rates for a small percentage, they’re inviting you to risk your reputation and authenticity. All you have to do, instead, is spend some time to study what your subscribers need and then email them timely content or products with titles that match the content. Emails are a great way to have a one-on-one conversation with your customers. People have more freedom with their emails and they’re ready to give them away for almost any piece of content. Good news is you can easily take advantage of this and generate leads by taking people’s email addresses. All you need to do is offer an irresistible piece of content (ebook, webinar, podcast, infographic, . . . ) in exchange for an email address. Bad news is that you should go a long way before you could turn your email leads into customers. So you can’t just expect people to buy from you after they became your email lead. Anyway, before anything you should start collecting valid emails. You need opt-in forms and boxes so that people can easily enter their emails and probably receive your free offer. Then you need analytics such as open/click-through rates, subscribers, bounce rate, etc. I’d also add EngageBay to the list. Even in their free plan they offer some premium features such as email sequences, on-site pop-ups and forms, landing pages, etc. You can also use free plugins such as Newsletter or Mailpoet. I use Newsletter plugin for my newsletter but will most probably choose an email service provider depending on my future budget. With the free Newsletter plugin you can set a double opt-in process (sending a confirmation email), send a welcome email and contain in it any link or attachment (your lead magnet for example), manage your subscribers, make newsletters using a drag-and-drop composer, and see your open/click-through rates. Here’s a screenshot from its drag-and-drop composer. MailPoet is more popular than the Newsletter plugin. One of its greatest features is its automatic newsletters. You can send a newsletter X hours/days/weeks after someone subscribes, and you don’t have any limits on the number of newsletters. So you can send an automatic welcome message immediately after someone subscribes, and then start sending a series of automated emails every day. This is a great option especially when you want to set up a free email course for your subscribers. You can easily send a lesson everyday. The down-side of MailPoet is that in its free version you can only have 2000 subscribers which is a small number — you’ll beat that in a year. Spend some time to curate interesting and useful content. Ruining your authority is as easy as recklessly clicking the “send” button. No one unsubscribes because they have not received an email from you in a while. On the contrary, people unsubscribe because they receive too much low-quality content. Offer different lead magnets and segment your subscribers based on what content they are interested in. Then send them the kind of content they’re interested in. For example, people who have downloaded your SEO ebook are less interested in your guerrilla marketing tips. Email marketing is not an all-inclusive solution for your digital marketing strategy. It’s simply a medium alongside others. It has the most effect when appropriately combined with your other digital marketing tactics. Check out these email marketing ideas for increasing conversion rates. According to a report by Statcounter, a research company, 51.3% of pages were loaded on mobile devices in October , the first time they have surpassed desktop and laptop computers”. People are primarily using their mobile devices to access internet — doesn’t this sound an alarm in your head? 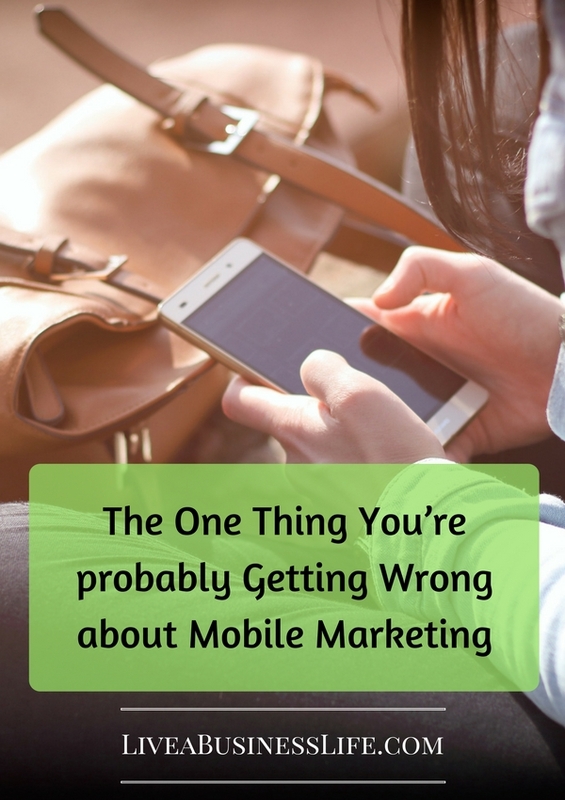 For me the alarm says not only should you optimize your website for mobile devices, you should have a specific strategy for targeting people on their mobiles. This means that you need to revise your digital marketing strategy in order to adapt it to the mobile devices. According to Google, micro-moments are the moments when we want help with our choices or decision-making, and we refer to our devices, especially mobile devices for help. 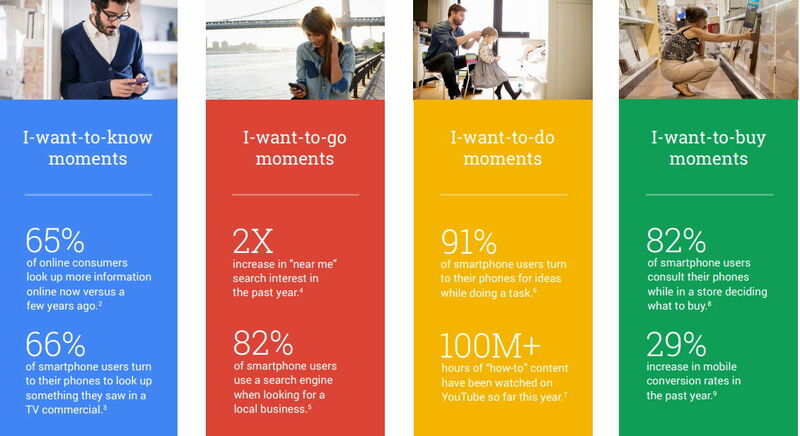 The three areas that have an influence on the micro-moments are: intent, context, and immediacy. By anticipating the micro-moments that are relevant to your business, you can curate content that immediately answers those moments. To do this you need a good understanding of your prospects’ urgent needs when using their mobile devices in different situations. Do your prospective customers need to know about your products or anything related to them? What are some popular search queries they use when searching on mobile devices? What are some information your prospective customers need to know before buying from you? Do you come up when people search for those queries? Do you need to use Google listing so that your info including your address, opening hours, phone number, etc are publicly displayed every time people search for you or your competitors? Do you need to target people with Google ads based on their location? Is there any specific incident happening at a particular place that could make people need your products or services? Can your business guide people to do a specific task? What are the top tutorials your prospective customers are looking for on the web? Do you need to provide information online about your products or services? Do your customers tend to do the purchase act on their mobile devices or PCs? Be there. You’ve got to anticipate the micro-moments for users in your industry, and then be ready to help when those moments occur. Be useful. You’ve got to be relevant to consumers’ needs in the moment, and connect people to the content they’re looking for. Be quick. They’re called micro-moments for a reason. Mobile users want to know, go, and buy swiftly. Your mobile experience has to be fast and frictionless. Since 2014, Google started evaluating websites for their mobile-friendliness. They literally ad a tag to your page on mobile search results to say it’s mobile-friendly or not. In the same year, Google introduced Googlebot Smartphone that is responsible for crawling content for smartphone searches. And in 2015, Google introduced its new mobile-friendly algorithm that gives a boost to mobile-friendly pages in Google’s mobile search results. The bottom-line is mobile-friendliness is an important ranking factor for mobile search results. How to make your website mobile-friendly? Simply use responsive themes — that’s a tip from a non-techie side of course. The other two ways are dynamic serving and separate URLs. Most of the WordPress themes are responsive these days, but it’s a good idea to double-check it. How to make sure your current website is mobile-friendly? Use Google’s Mobile-Friendly test. 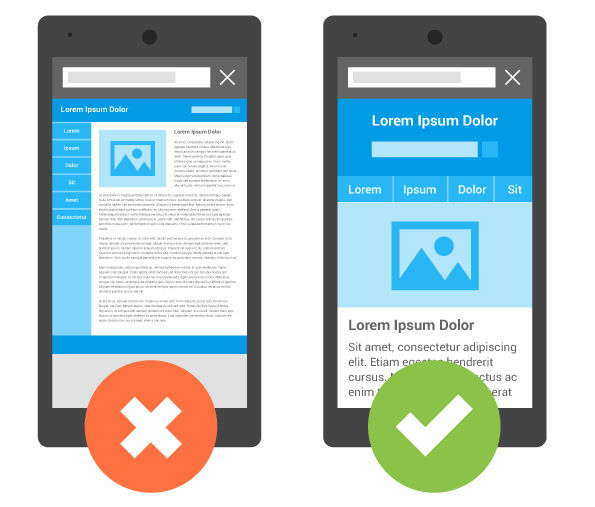 Run your pages in it to make sure they’re mobile-friendly. App-based ads: these are the ads you see while working with mobile apps. 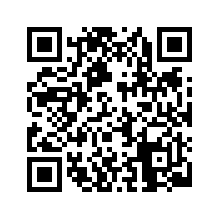 QR (Quick Response) codes: by printing these 2-dimensional codes, you can display text to the user, open a URL, save a contact to the address book or compose text messages. People just need to scan these codes with their smartphones. You can generate QR codes using online code generators (click here or here), and then download and print them on anything. When people scan them with their smartphones, your desired actions will be done. Location-based ads: these ads are targeted to people in a specific location (for example, within a 1-mile radius of a business location). Mobile search ads: the search engine ads that appear in the mobile search results. Image-based ads: Image-based ads that appear on mobile devices. SMS: ads that are sent as short messages to people’s phone numbers. Location-based ads are delivered through two channels: a) apps that use foreground (while using the app) or background (while not using the app) location tracking, and b) search engines. 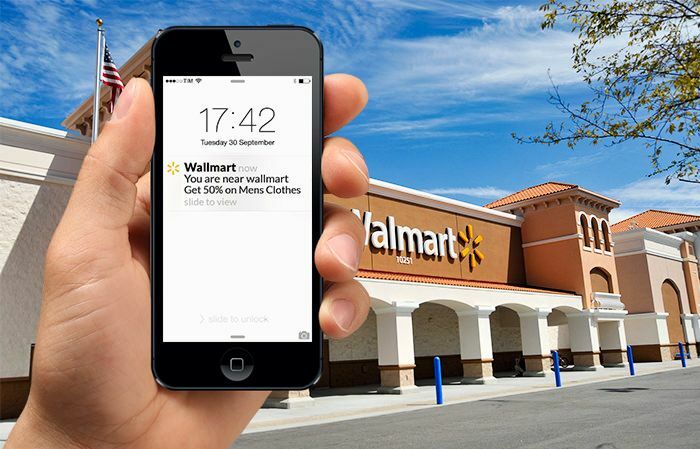 Location tracking happens through using the IP address, GPS, or Bluetooth (using beacons). But when talking about location-based ads, people have GPS in mind, and with ample reason — GPS has the most use in location-based ads. 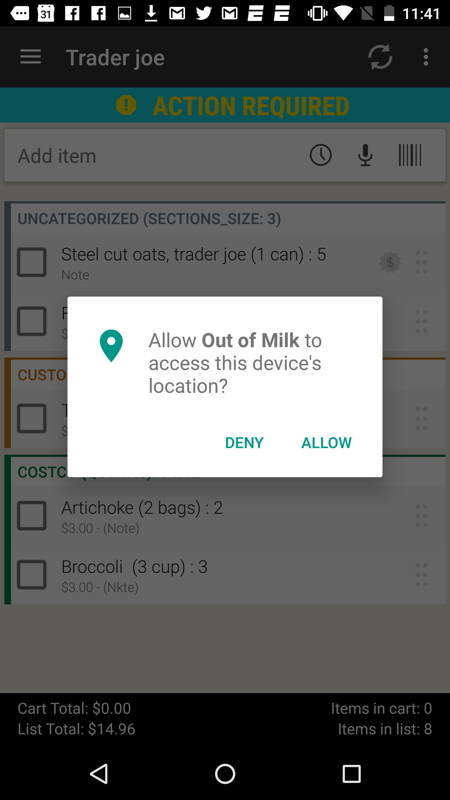 When you install an app, you might be required to give it the permission to access your location. If you permit the app to have access to your location, chances are it will show you ads or send you messages based on your location and in specific times. Say you’re walking the streets when all of a sudden you receive a message from your Walmart app saying that you’re near one of its stores and that you’ll get 50% off on mens’ clothings if you walk into the store and buy now. This is a good example of geofencing. As understood from its name, geofencing enables the store owners to set a virtual fence around their stores so that whenever one of their app users enters the fence, he gets a message prompting him to enter the store and buy. Say you receive an ad informing you that a new restaurant near you is offering a 25% discount on some of its dishes. You figure it’s a good choice because you were just about to plan your wedding anniversary night and you were looking for a restaurant near your house. This is a good example of geo-targeting. In geotargeting the advertiser specifies people in a specific location to see his ad. Beacons are some small devices that connect to people’s smartphones via bluetooth. 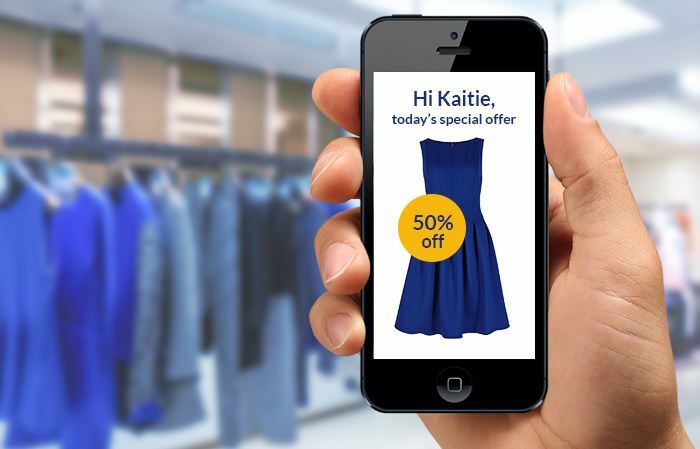 Business owners can install these beacons in their stores so that whenever a Bluetooth-enabled device that has already installed the app comes into the range of the beacon, it gets specific messages such as coupons or special offers. The point about these devices is that they can send a specific message based on the exact location of the device in the store. Mobile marketing automation platforms such as Leanplum, Urbanairsip, Appboy, and Marketo enable you to have full control over your mobile marketing tasks. From location-based push notifications, in-app messaging, SMS and MMS, to different sorts of analytics and customer data, these platforms can help you reap the most benefits out of your customers’ mobile phones. The real value of these platforms lies in the fact that they provide an omni-channel marketing solution that considers how customers move from one channel to another while interacting with a business. Another way to do in-app advertising is using mobile ad networks such as Google’s Admob, Adcolony, unity Ads, Smaato, Applovin (its app marketing feature) and others. The general idea behind these ad networks is that they connect mobile advertisers with app developers. They buy in-app ad spaces for advertisers and offer ads to the developers so that they can monetize their free apps. These networks also enable the advertisers to target their audience based on location, device, operation systems, interests, gender, etc. Apart from in-app ads and push notifications from the apps, you can use search engine ads for a geo-targeted mobile marketing campaign. Google Adwords allows advertisers to target people on their mobile devices and in different geographic locations (see Google’s guide on this). When you set up your typical ad campaigns on Google adwords, they will be automatically eligible for mobile devices too. However in order to target specific devices, Google suggests that you set a negative device bid adjustment. My take is that you can do the same thing with your desktop bid. You can go to the “Devices” section and decrease desktop bid amount by 100% so that your campaign is specifically targeted to mobile devices. For more information on mobile ad campaigns and how to effectively implement them, you can visit Google’s Adwords help page on mobile advertising. Wordstream has also some great guides on doing any type of search engine advertising including Mobile PPC. Retargeting is a digital advertising technique that shows your ads to the people who have left your blog without completing your desired action. Using this technology you can drop a retargeting cookie on your visitor’s browser, and then target him with your relevant ads across some relevant websites. In order to do retargeting you need to use retargeting platforms such as Retargeter , Adroll, or Google’s Remarketing. Social media platforms (e.g. Facebook) also offer retargeting options in their ads section. These platforms provide some retargeting pixels (snippets of code) for you to insert in your whole website or some pages of your website. You can also have different pixels for different banner ads so that you can differentiate between your audience. Then every time someone visits your pixeled page, they get cookied and turn into your audience (there is probably an “audience” section in the dashboard). If the cookied person does a particular action (buys or converts, etc. ), a burn pixel will be tagged to him so that he will be un-cookied, otherwise he will remain cookied and then your ads will be shown to him even after he has bought from you (you don’t want this to happen — it’s annoying). Your retargeting platform has a network of partner websites that could show your retargeting ads to your cookied visitors. You could even choose the websites you want to show your ads on based on their traffic or relevancy. Search retargeting targets the audience based on some keywords you select. Say for example somebody enters a search query in a search engine and then selects a website from search engine results page. If you had targeted that keyword (through your retargeting platform of course), and if the website the visitor clicks on is in your retargeting platform’s network, the visitor will be cookied. Then based on the amount of bid you’ve set for the keyword, your ad will be selected to be shown across various websites. Segment your visitors based on their interests (e.g. people who visit your shoes page v.s. People who visit your pants page) and target them with relevant ads. Insert a clear call-to-action or a relevant coupon in the ad. Have a good timing for your retargeting ad (e.g. people shopping for travel should be retargeted immediately; people shopping for luxury goods should be retargeted later). Measure your retargeting success by tracking both click-through-rates and view-through rates. Your retargeting platform could show your view-through attribution which is the number of people that visit you after they saw your ad. Studies have shown that click-through rates don’t tell everything about your campaign’s performance. On many occasions people don’t necessarily click on your ads but visit your website after seeing them. There is always room for improvement. The greatest of digital marketers know the value of learning and are constantly trying to adapt to the changing digital landscape. Google’s Panda Algorithm update was one of the prominent digital landscape changes. When it hit the digital publishing industry in February 2011, lots of legendary websites lost their positions. Google’s aim was to weed out “content farms,” which produced nothing but low-quality content in great quantities. And it was done. Lots of High-profile companies lost their organic traffic and as a result their fame and income. This happens from time to time when a new major update is introduced to refine users’ experience. Google’s mobile-first indexing might be the future’s major shift in the digital landscape. Since 2015, more than half of Google’s searches are happening on mobile devices. So Google has been thinking that maybe it’s better to consider only the mobile version of a page when trying to index it even for desktop searches. This means a major drop-down in the organic traffic of the websites that don’t care about their mobile versions. A solid digital marketing strategy has a solid foundation but is open to any such changes in the digital landscape, whether this means striving not to be wiped out for lacking the new digital requirements or trying to keep up with the digital savvy competitors. Digital content, email, mobile, social media, search engines, and many other digital marketing tools and assets are necessary to use but mastering the way they change and adapting to the new tweaks and turns are the true winning tickets in the digital age. 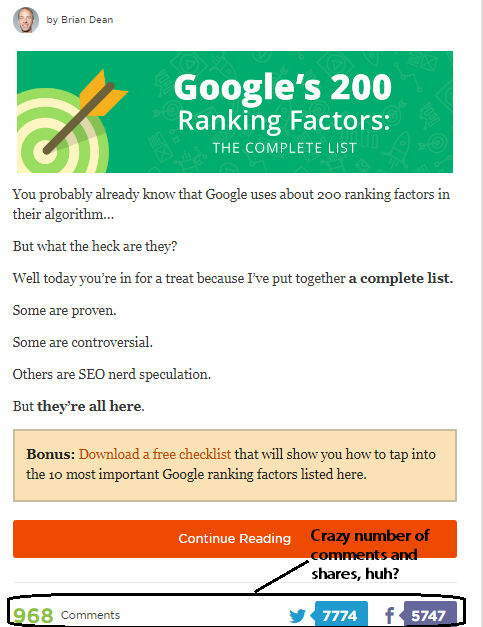 Subscribe to my Newsletter and get your free SEO ebook NOW! I enjoy the info you provide here. Kudos. Our community is better because you are in it. I am new to this issue, but for me it elucidated several questions. Congratulations on your knowledge on the subject. Thank you very much. Make use of good instagram tools like hashatory. Its for finding hashtags for your post.